The all-new Alfa Romeo Giulia has been unveiled on the 105th anniversary of the founding of A.L.F.A. (Anonima Lombarda Fabbrica Automobili) at a special event in the newly-refurbished Alfa Romeo Museum – “La macchina del tempo” – in Arese, Italy. The BMW 3 series rival gets a hair raising 503bhp Quadrifoglio engine that will reach 0-62mph in just 3.9 seconds, and is due to go on sale at the start of 2016. 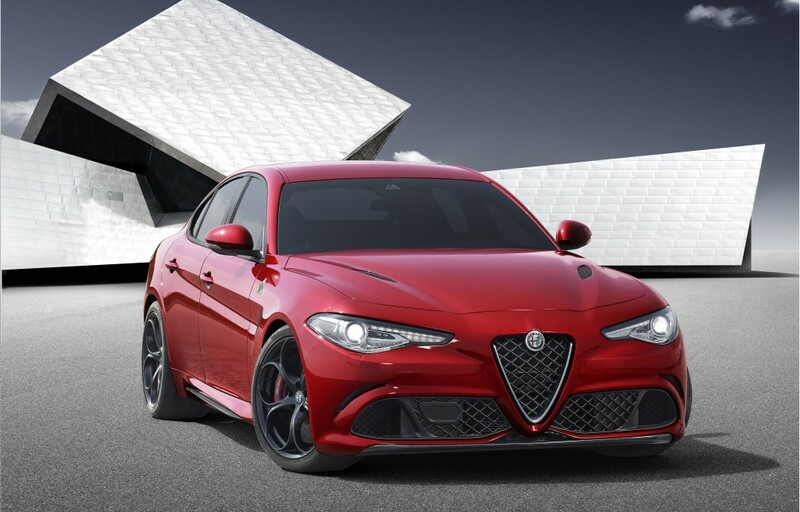 Developed by the best engineers, designers and stylists within FCA, the new Giulia embodies the core elements which have made Alfa Romeo one of the world’s best-loved automotive brands – distinctive Italian design; innovative powertrains, perfect weight distribution, unique technical solutions and the best weight-to-power ratio. The compact proportions of the Giulia have evolved from its all-new, rear-wheel drive design (all-wheel drive will also be available). With the engine and major mechanical components arranged between the axles to ensure perfect 50/50 weight distribution, the Giulia has very short overhangs, a long bonnet and muscular haunches, while the wheelbase is longest in its segment to maximise stability, comfort and practicality. Under the bonnet, a range of state-of-the-art engines power the new Giulia with a bespoke unit created for the top-of-the-range Quadrifoglio version. Tuned by engineers from a Ferrari background, the flagship V6 turbo petrol powerplant delivers an impressive 510hp, propelling the Giulia Quadrifoglio from 0 to 62mph in just 3.9 seconds, while also offering surprising fuel efficiency thanks to electronically-controlled cylinder deactivation system. As with all next-generation petrol and diesel engines, this six-cylinder unit is made entirely of lightweight aluminium and will, of course, deliver that distinctive Alfa Romeo sound to complement the performance. To emphasise the purity and excellence of the mechanicals, a decision was made about the electronics, they have only been used to improve the driving experience. The Giulia introduces an innovative double-clutch Torque Vectoring system to allow the rear differential to control the torque delivery to each wheel independently, improving traction in low grip conditions without having to run up against an invasive stability control system. The Integrated Brake System is also being introduced on the new Alfa Romeo Giulia – an innovative electromechanical system which combines stability control and a traditional servo brake for instantaneous brake response and record-breaking stopping distances. The new Giulia Quadrifoglio even has a front Active Aero Splitter to actively manage downforce for higher stability and better cornering grip even at high speed. These state-of-the-art systems are all governed by Chassis Domain Control, the ‘brains’ of the on-board electronics which has been assigned the specific task of optimising performance and driving pleasure. The car also features a new Alfa DNA system which modifies the car’s dynamic behaviour according to the driver’s selection: Dynamic, Natural, Advanced Efficient (a new energy-efficiency mode introduced on the Giulia) and, naturally, Racing mode for high performance versions. Think I'll be joining you with the saving, lovely looking car! No need to save. Simply wait a few extra months and pick one up for the same price as a 12 year old diesel A4. Assuming of course anyone actually buys them in the first place. That's a beautiful looking car. Right move by Alfa. | No need to save. Simply wait a few extra months and pick one up for the same price as a 12 year old diesel A4. Assuming of course anyone actually buys them in the first place. I think that will be a great seller if priced right. Wow! I need one of those! | I think that will be a great seller if priced right. Can't see it myself but would be happy to see a few of them on the roads that's for sure!